Select the "Fundraising Event" button in your Admin Dashboard to view all of your past and current events. Select the "Edit" button beneath the Fundraising Event, and you'll be directed to your Event Editor. 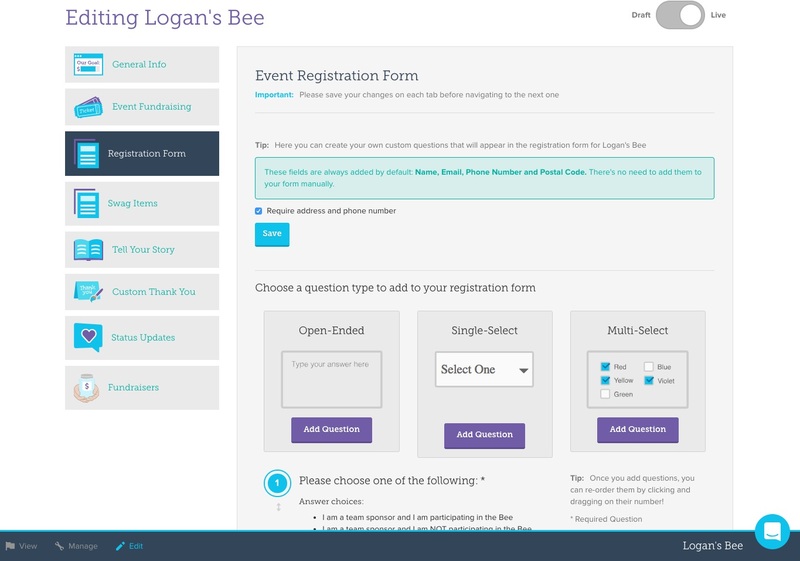 Step 3: Navigate to "Registration Form"
From the left navigation, select "Registration Form" to begin customizing your event registration questions. Name, Email, Phone Number and Postal Code are automatically recorded. You can opt to also collect your registrant's Address and Phone Number by selecting the checkbox at the bottom. For more detailed registration information, you can add open-ended, single select, or multi-select custom questions to your registration form. You can add as many of these question types as you like! To require any of these custom questions to register, select the "Required" box. Remember to select "Save" before navigating away from the page!